I will be attending the Spring Southern SxS shoot and exhibition at Deep River Sporting Clays in Sanford, NC. Look for me in the Parker/LC Smith Challenge tent by the dove field. The SxS is being held April 28, 29 & 30, 2017. I will also be Exhibiting at the Northeast SxS held at Hausmans Hidden Hollow in Friendsville, PA on June 1, 2 & 3, 2017. Upcoming Gun shows that I will be attending. The Empire State Arms Collectors Spring Gun Show will be held in Rochester, NY on April 6th and 7th at the Rochester Tech Park (bldg. 4) in Gates. 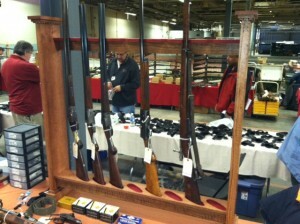 The New York State Arms Collectors Spring Gun Show will be held in Syracuse, NY on April 20th and 21st at the State Fair Grounds Center of Progress Building. 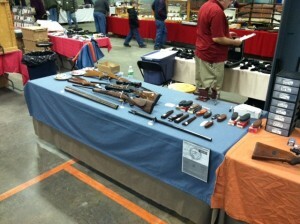 The January 2013 Rochester Gun Show was very well attended. Especially on Saturday. The attendees started coming in as soon as the door opened and for the rest of the day, the new (bigger) venue was full. Thank you to all who stopped by to see me at my two tables. 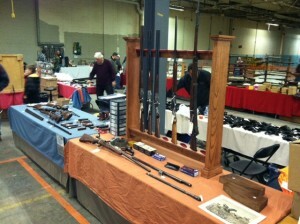 The Empire State Arms Collectors’ first Gun Show of 2013 will be held on January 5 & 6.